It has often been argued that ‘modern’ leisure was born in the period from the mid-nineteenth century to the outbreak of World War One. Then, it has been suggested, that if leisure was not ‘invented’ its forms and meanings changed. Despite the recent expansion of the literature on Irish popular cultures – perhaps most strikingly sport – the conceptions, purposes, and practical manifestations of leisure among the Irish during this critical period have yet to receive the attention they deserve. This collection represents an attempt to address this. In twelve essays that explore vibrant expressions of associational culture, the emergence of new leisure spaces, literary manifestations and representations of leisure, the pleasures and purposes of travel, and the leisure pursuits of elite women the collection offers a variety of perspectives on the volume’s theme. As becomes apparent in these studies, all manner of activity, from music to football, reading to dining, travel to photography, dancing to dining, visiting to cycling, child’s play to fighting and attitudes to these were shaped not just by the drive to pleasure but by ideas of class, respectability, improvement and social control as well as political, social, educational, medical and religious ideologies. Contributors John Borgonovo is a historian at the School of History, University College Cork. He has published extensively on the Irish Revolutionary period. His latest monograph, The Dynamics of War and Revolution, Cork City 1916-1918 (Cork University Press, 2013), explores the relationship between the First World War and the transformation of nationalist politics. Orla Fitzpatrick is a PhD researcher at University of Ulster. She has worked as the Librarian at the National Museum of Ireland and contributed articles on material culture and the history of photography to a variety of journals Brian Griffin is a Senior Lecturer in History at Bath Spa University. 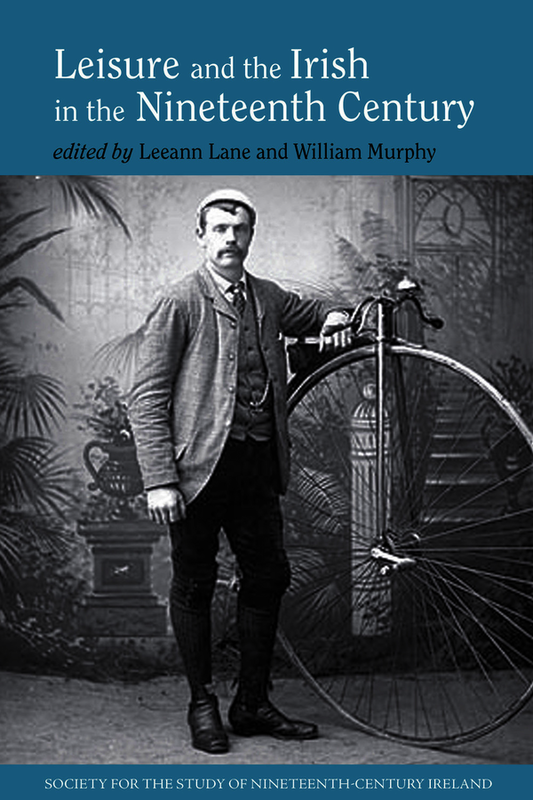 His main research focus is the social history of nineteenth-century Ireland, with particular interests in police, crime and sport, particularly cycling. He is the author of Cycling in Victorian Ireland (Dublin, 2006). Leeann Lane is Head of Irish Studies and Head of the School of Humanities at the Mater Dei Institute of Education, Dublin City University. She is the author of Rosamond Jacob: Third Person Singular (2010). She is a member of the "Expert Advisory Group on the Decade of Commemorations" appointed by the Government in 2012. Patrick Maume is a graduate of UCC and QUB, now living in Dublin, who works as a researcher for the Royal Irish Academy's Dictionary of Irish Biography. He has produced numerous publications on nineteenth and twentieth-century Ireland with particular reference to media and print culture, including The Long Gestation: Irish Nationalist Political Culture 1891-1918 (1999). Rachel Murphy is a member of the School of History at University College Cork, where she is studying towards a PhD in Digital Humanities. She holds an MA in English Language and Literature from the University of Oxford and an MA in the History of Family from the University of Limerick. Her current research focuses on the landed estate in Ireland during the nineteenth and twentieth centuries. William Murphy is a lecturer in Irish Studies at the Mater Dei Institute of Education, Dublin City University. William is co-editor of The Gaelic Athletic Association, 1884-2009 (2009) and author of Political Imprisonment and the Irish, 1912-1921 (2014). He is co-founder of Sports History Ireland. Philip McEvansoneya is a lecturer in the history of art at Trinity College Dublin. He has published widely on painting in Europe, 1600-1900, with particular reference to Ireland and Britain. His current research is on aspects of art in Ireland, 1800-50. James H Murphy is Professor of English at DePaul University, Chicago. Among his most recent books are Ireland’s Czar: Gladstonian Government and the Lord Lieutenancies of the Red Earl Spencer, 1868-1886 (2014), Irish Novelists and the Victorian Age (2011) and, as editor, The Oxford History of the Irish Book, iv, the Irish Book in English, 1800-91 (2011). Maeve O'Riordan is an Irish Research Council Postdoctoral Fellow at the Centre for the Study of Historic Irish Houses and Estates at Maynooth University. She is currently completing her first monograph on women of the Irish Country House, 1860-1914, to be published with Liverpool University Press in 2016. She has taught courses on Women's History, Gender History, and Country House Studies at both Maynooth University, and University College Cork, where she completed her PhD. Maeve has chapters and articles published and forthcoming on Domestic Servants and Employers, Sexuality, Childhood in the Country House, and Women and the First World War. Kevan O'Rourke is currently completing a PhD thesis entitled "Chronicler of the Irish Peasantry: A study of the life and works of William Carleton (1794-1869)" at Mater Dei Institute of Education, a college of Dublin City University. Matthew Potter works in Limerick City Archives, and is the author of several articles and books, including a history of municipal government in Ireland. His current research interests include municipal cemeteries, social housing and Limerick Lace. Brendan Power holds a PhD in History from Trinity College, Dublin. A former Irish Research Council Scholar, his research centres on the history of uniformed organisations for adolescent boys in the late nineteenth and early twentieth centuries. Vanessa Rutherford, MA, PhD is a Research Fellow and Lecturer at the School of Education, University College Cork. Research interests and publications comprise social, cultural and historical construction of childhood; socio-cultural approaches to learning, identity, voice, cognition and development; and, the history of education. Methodologically Vanessa’s work engages with discourse analysis and historical inquiry that extends to quantitative research. Vanessa has lectured at NUI Maynooth, the Open University and Dublin City University. Edited contibutor list: John Borgonovo is a historian at the School of History, University College Cork. Orla Fitzpatrick is a PhD researcher at University of Ulster. Brian Griffin is a Senior Lecturer in History at Bath Spa University. Leeann Lane is Head of Irish Studies and Head of the School of Humanities at the Mater Dei Institute of Education, Dublin City University. Patrick Maume is a graduate of UCC and QUB, now living in Dublin, who works as a researcher for the Royal Irish Academy’s Dictionary of Irish Biography. Rachel Murphy is a member of the School of History at University College Cork, where she is studying towards a PhD in Digital Humanities. William Murphy is a lecturer in Irish Studies at the Mater Dei Institute of Education, Dublin City University. Philip McEvansoneya is a lecturer in the history of art at Trinity College Dublin. James H Murphy is Professor of English at DePaul University, Chicago. Maeve O’Riordan recently completed her PhD ‘Home, family and society: women of the Irish landed class, 1860-1914. A Munster case study’ at University College Cork. Kevan O’Rourke is currently completing a PhD thesis entitled “Chronicler of the Irish Peasantry: A study of the life and works of William Carleton (1794-1869)” at Mater Dei Institute of Education, Dublin City University. Matthew Potter works in Limerick City Archives, and is the author of several articles and books, including a history of municipal government in Ireland. Brendan Power holds a PhD in History from Trinity College, Dublin. Vanessa Rutherford, MA, PhD is a Research Fellow at the School of Education, University College Cork. Dr Leeann Lane is Head of Irish Studies at Mater Dei Institute of Education, Dublin City University. Dr William Murphy is Lecturer in Irish Studies at Mater Dei Institute of Education, Dublin City University.